Way back in 1999 I was going through a rough time. My husband and I separated and I was living in our big house in Pewaukee, Wisconsin by myself. I decided I was going to get a dog to keep me company. As a fan of the PBS show “Wishbone,” about the ventures of a cute Jack Russell terrier, I decided that is the breed I wanted. I found a classified ad in the Milwaukee Journal Star for Jack Russell terrier puppies. I went and looked. It was a rundown house in a bad area of Milwaukee, but the puppies were cute. Both Jack Russell parents lived there, and they had four puppies to choose from. I chose one of the females, a little cute thing with a black dot on her head. The owners named her Dottie. At first I didn’t like the name, but I changed my mind and decided it was a good fit. Dottie was a naughty puppy. I put her in a crate while I went to work and she hated that. During her entire life she couldn’t stand being crated. Once while flying home to visit family in Lincoln I decided to take Dottie with me on the plane. I was able to bring her on board in a pet carrier but she bit her way through it. I spent the entire plane ride trying to hold her head in the carrier through the opening she ripped though. 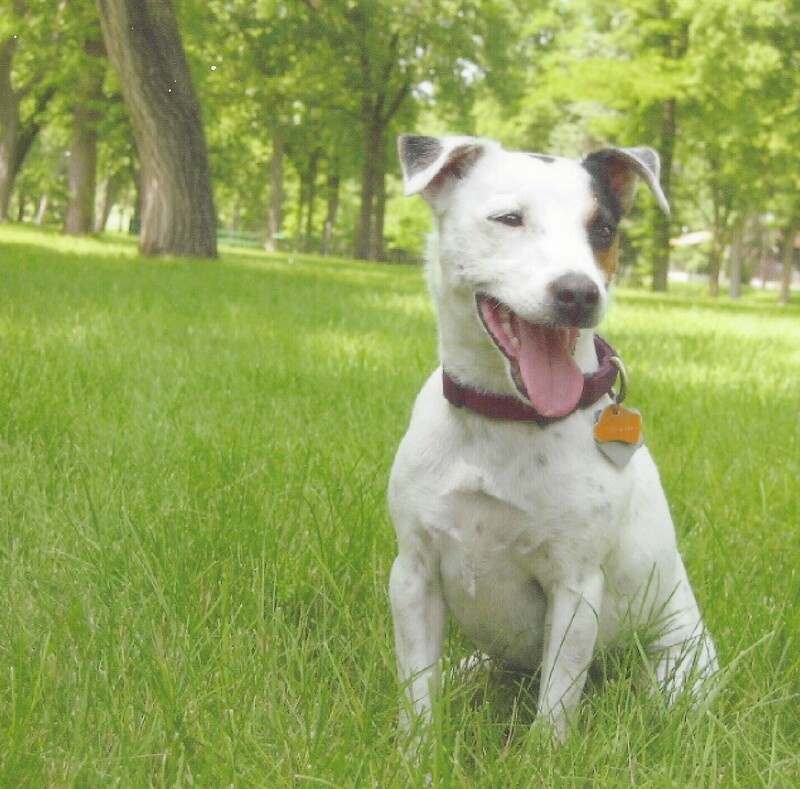 While living alone in the Pewaukee house, Dottie was pretty much a lifesaver for me. She kept me company. She gave me a reason to smile. When I decided to move back to Lincoln, Dottie and my new puppy Russell came with me. Dottie was constantly by my side wherever I went in our house. Dottie was always healthy and strong, and I thought if any dog were to live to 18, it would be her. She was like a little athlete, and was crazy about her Frisbee. She carried it around, she slept with it, and loved chasing after it. In the last year or two Dottie gave up her Frisbee obsession and started to slow down some. This last weekend she started vomiting and stopped eating. I took her to the vet on Monday and she underwent blood tests. The vet’s office called Monday afternoon to say her red blood cell levels were dangerously low and her kidneys were failing. The vet recommended putting her down right away. I thought about it. I asked to see Dottie. When I saw Dottie up walking around, I decided to take her home. I took her to another vet the next day to get a second opinion. He told me there was some hope for Dottie, and I was encouraged. The plan was to put Dottie on 24 hours of IV fluids. He said that often can perk dogs up The process started at this vet clinic. Then I transported her the the Lincoln emergency vet, which is open all night, so she wouldn’t be alone. By the minute, though, it was clear Dottie was losing strength. This morning the plan was to pick Dottie up from the emergency vet and take her back to the other vet to continue her fluids. However she was completely lethargic — the life in her was all but gone. The vet put her on the table and Dottie and I locked eyes. The vet said nothing more could be done for her. She was not going to get better. She could not walk. She could not lift her head. I made the only decision I could make and told the doctor to proceed with the euthanization. In a matter of seconds Dottie — my little shadow and my baby — was gone. Dottie was always there for me no matter what. If I was sad, Dottie could make me happy. She always wanted to be with me. My mother said she was probably the most loyal dog anyone could ever have and my mother was right. Farewell Dottie my love. I will never forget what you meant to me and how you rescued me during one of the most difficult periods of my life. I will miss you more than anyone will ever know.